Order before 9am for Same Day Delivery! Classic and traditional, 2 dozen long stemmed Roses are beautifully presented amongst delicate tissue paper in a splendid gift box to convey that special message of love and adoration to your loved one.When 24 Roses aren't quite enough, spoil your loved one by adding a Premium bottle of Moet and Chandon to your order. Sure to leave a lasting impression. Great service and beautiful flowers - thank you. 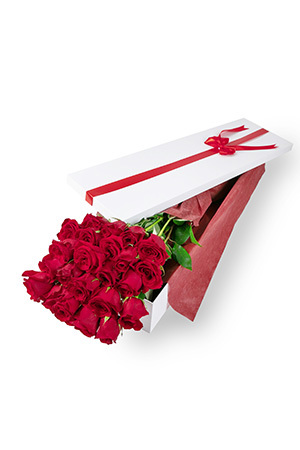 Hi yes was very pleased with your service any of my issues was delt with very fast and now my special lady is very happy with her gift things guys I will be use you next time ???????????????????? The recipient of my gift, said the deliverer was extremely polite and cordial. Ordered the evening before Mother's Day because I couldn't make it home. The quick turn around and presentation got me seriously out of the dog box!!!! Great service and prompt delivery!